This may be the first (but certainly won't be the last) Coen brothers movie used for a state film -- when we have the chance to go with Joel and Ethan, we will. So our Arizona film is Raising Arizona, the silly and slapstick (and yet somehow also poetic) story of an ex-convict and his police officer wife who go to rather extreme measures to overcome their childless state. Though the credits say it was directed by Joel Coen, surely Ethan helped as well. And they both wrote. Familiar faces include Nicolas Cage, Holly Hunter, John Goodman, and Frances McDormand. 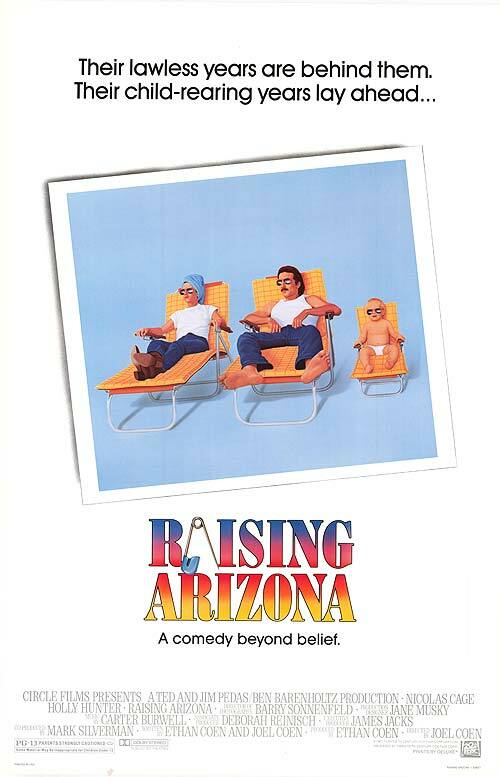 Don't have to go much farther than the title to see the Arizona connection in the film, but the title refers to the name a person, a family, the state, and an unfinished furniture emporium. The film is set in Arizona and pretty much filmed in the state, in all its emptiness and grandeur; in Phoenix, Tempe and Scottsdale and also in Dudleyville, Superior, and Carefree. Is there any spiritual content in the film? Well, some of the marketing referred to it as "a comedy beyond belief." We hear Ode to Joy early in the film. H.I. 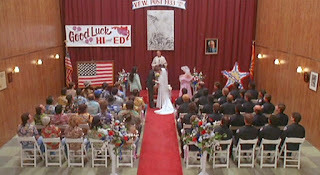 and Ed are married by what appears to be a Methodist minister. And as a narrator, H.I. says, "Let he who is without sin cast the first stone" before telling the tale of a kidnapping. And the final dream sequence of the film has a lingering tone of grace. Parts of Easy Rider were filmed in Arizona, and all of Electra Glide in Blue was filmed in Arizona. Electra Glide, the story a motorcycle cop, was made in response to Fonda and Hopper's iconic biker film and is arguably much better. One of the scariest and creepiest of vampire movies, Near Dark, was set and filmed in Arizona. Another cult film, Robert Zemeckis' Used Cars, is a black comedy set and filmed in AZ as well. Thelma and Louise, Nurse Betty, and, of course, Disney's Brighty of the Grand Canyon all make good use the Grand Canyon. A Movie Church featured last year, Lilies of the Field, was also set and filmed in Arizona. We did get to the movies in the movies here in Tucson, going to The Loft, an independent art house. Though the weather was rainy and chilly, one can tell by the patio that the place has a southwestern feel. We went to see the documentary Hitchcock/Truffaut. There was a slight Arizona connection in the film, as it featured the opening scenes of Psycho (which were set and filmed in Phoenix). It would have been nice to be around for their Mondo Mondays, which this week features The Giant Spider Invasion (though I guess we should save that film for Wisconsin).